For all you craft nerds out there, I thought I would share a little project I did a while back. I was struggling to figure out something cool to give my mom for Christmas, so I did some brain storming and came up with the idea to make a wind chime from old bike parts. 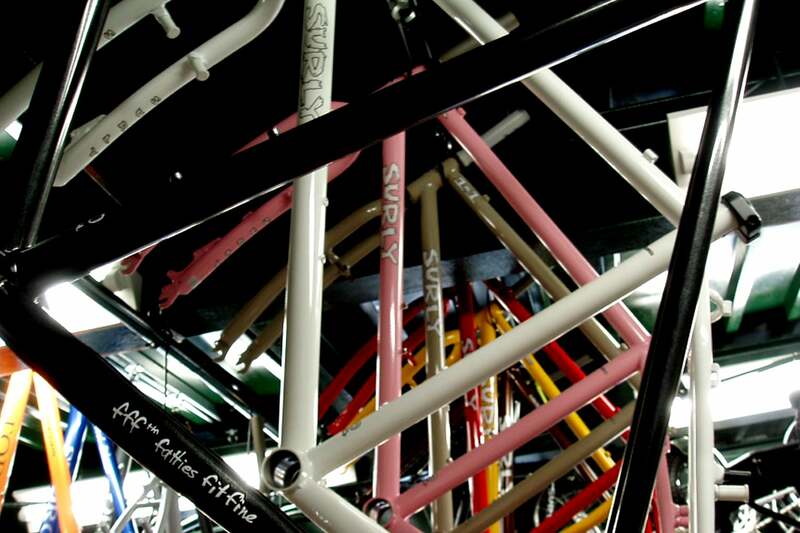 Lucky for me, I have access to a pile of scrapped Surly frames and a garage full of old bike parts. If you go online and search for something like “DIY wind chime”, you will get a crap ton of instructions on how to do it. Like most things on the internet, some instructions are great and some are garbage. 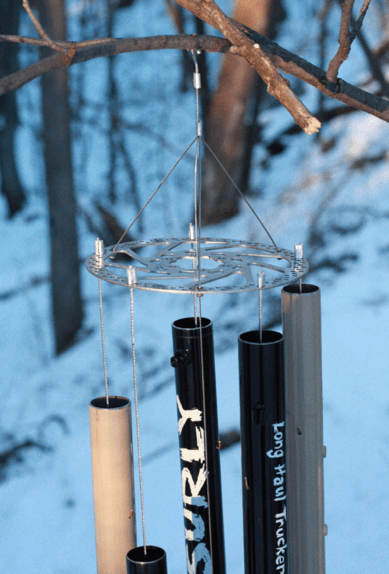 You will read a lot about tuning the notes of the wind chime to make a musical chord and the construction methods needed to get the best resonance out of the tube. For example, the tube should be mounted 22.4% of the total length from the end of the tube. This measurement puts the mount in a vibration node and helps the tube ring louder and longer… cool. In the end, I grabbed three Surly LHT frames and cut the top tube, down tube, and seat tube out of each of them for the chime. I used a bent spoke for the hook on top, brake and shift cables throughout, a disc rotor to space out my tube mounts, a cassette cog for my “striker”, and a Surly OD chainring for my wind catcher on the bottom. I didn’t get in to tuning my wind chime like a lot of the DIY stuff tells you to do. 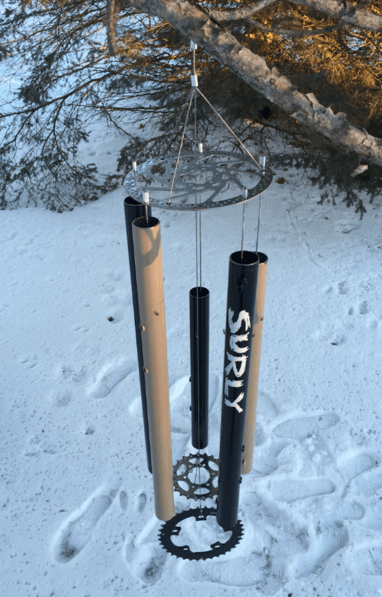 This had me nervous that my wind chime would sound like a box of scrap metal; however, I was happy to find that the chime I threw together doesn’t sound half bad. Sounds like a wind chime! Anyway, if you’re a pack rat like me that can’t throw things away, maybe there are a few wind chimes in your future as well. Happy crafting folks!